Mercedes-AMG GmgH has had great success in the past producing a customer sport racing car in the SLS AMG GT3 and will likely offer an affordable CLA 45 AMG race car in the future. The new CLA racer that will be unveiled in Frankfurt will be a concept car that will very likely be a preview of good things to come. Mercedes is big into customer supported race cars and this will give smaller teams an affordable alternative to the ultra-expensive SLS AMG GT3. Mercedes tells us the new CLA 45 AMG Racing Series concept car will be developed and sold globally in 2014 if demand is high enough. The car would compete in the highly competitive 2.0-liter turbocharged class and would come with a high-performance version of the engine that comes in the road-going premium compact CLA-Class. The horsepower will vary according to the race rules and race series and permanent all-wheel drive or purely front-wheel drive possible as in the standard version. 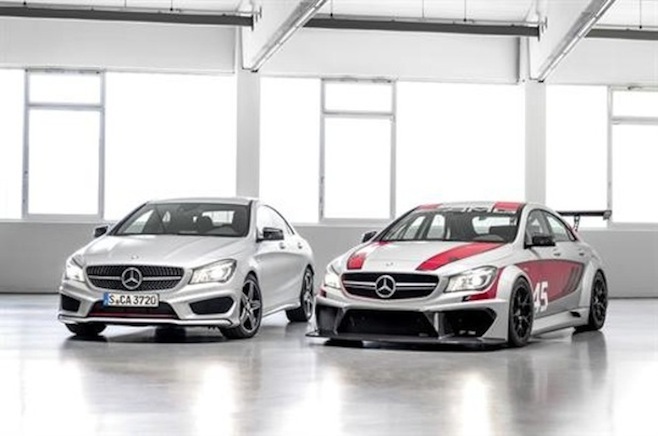 The new CLA 45 AMG Racing Series concept shows Mercedes commitment to customer motorsport around the globe. Ola Källenius, CEO of Mercedes-AMG GmbH said in the press release, “We are also seeking to offer interested customer teams a competitive, near-standard racing car with an excellent level of safety in the popular four-cylinder segment. The tremendous success of the SLS AMG GT3, which is now being raced by customer teams across five different continents, makes us highly confident." The CLA 45 AMG Racing Series will feature extra suspension upgrades to make it ready to be raced on all five continents. The concept car will come with a wider track at the front and rear, and allows numerous adjustments for individual racetrack setups. The tuned suspension will have fully-adjustable spring rate, damper characteristics and track and camber at the front and rear axles. It will come with larger AMG high-performance brakes with ventilated discs at all four corners. The new CLA racer will be ultra-lightweight and will feature a carbon-fiber front and rear apron, flared wings and side sill panels to improve the already aerodynamic CLA. The treadless performance racing tires will be much wider and along with the carbon-fiber rear wings and large cooling apertures for engine and brake cooling, the CLA 45 AMG Racing Series has an imposing stance. The new race will take the already formidable 2014 CLA 45 AMG with the world’s most powerful four-cylinder and will improve the aerodynamics. The new CLA Racing Series will feature newly developed carbon-fibre components with a front splitter, rear diffuser with three fins and an adjustable rear aerofoil that will ensure additional downforce at high speeds. Custom air intakes in the side sill panels at the rear ensures improved cooling of the larger rear brakes. Inside the cockpit, the new CLA race car gets a high-strength steel roll-cage, carbon-fiber P 1300 GT racing bucket seat from Recaro and an integrated fire extinguishing system. For optimum shifting on the track, the racing steering wheel comes with paddle shifters for quick gearshifts. Check back often as Torque News gives you the latest information on the new 2015 Mercedes-Benz CLA 45 AMG Racing Series concept when it officially breaks cover at the Frankfurt Auto Show on September 10.